Maybe it was the gloomy, overcast late-winter’s day. Or maybe it was the dingy rural landscape, weather-weary and tax-trodden. 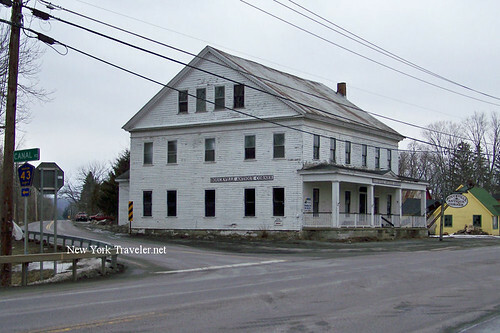 At any rate, I was compelled to snap photos of this tiny little town called Bouckville, NY, as I zipped through on my way home from Hamilton, NY. 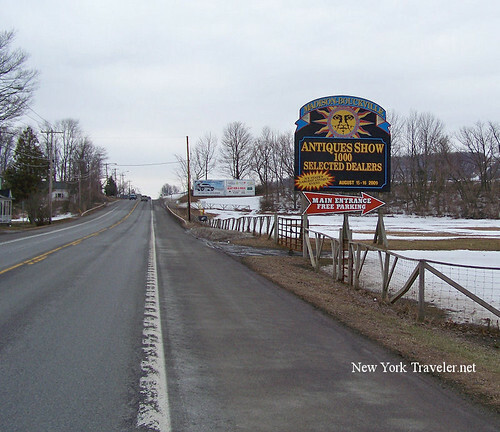 Bouckville’s only claim to fame must be its status as the location of the largest antiques show around– the Madison-Bouckville Antiques Show. People come from all over the country and the world to scour the tables, barns, tents, and antique stores during the big weekend in August. I’ve been through the area during that weekend, and it is nearly impossible to drive through the undulating crowds of antique hunters. Traveling here in early March is another story. The entire town was like a ghost town. Oh sure, there were signs of life around– I saw another car on the road, and the gas prices were up again– but I didn’t see a person anywhere. 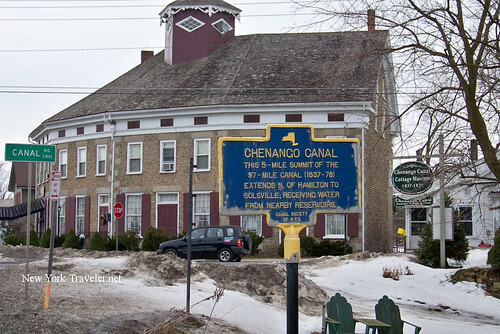 And I stopped to see if the Chenango Canal Cottage Museum was open– not a soul around. 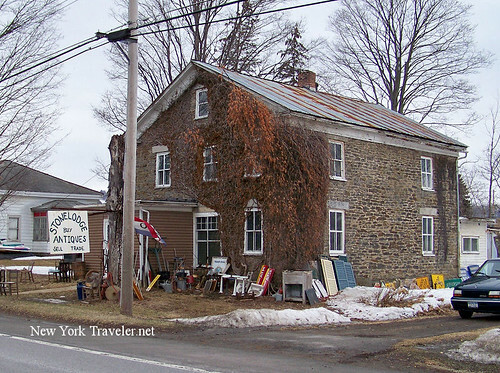 The little museum– not much bigger than a single room in an average-sized house– is along the old Chenago Canal, which is also near the Landmark Tavern, a somewhat renowned local eatery and inn (Bouckville is near Hamilton, NY, home of Colgate University). So besides the closed museum, the tavern, and the empty fields, the only thing around to take photos of were the old buildings. Bouckville has tons of these. Many of them had a grandiose elegance to them, despite their dull and weary appearances. Several had antique shops in them (closed for the season). Oh and there was this very interesting mill. A car was parked outside, but I never saw nor heard any activity. So there you have it: Bouckville, NY. 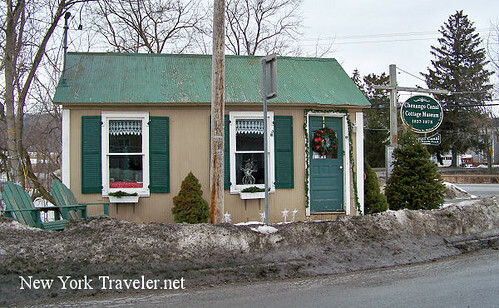 A fine example of the hundreds of tiny little ultra-rural communities in Upstate NY. What a nice night having your visit. Thank you for leaving a comment and put it me in your favorite list. I did the same too for yours. Your first ad has been approved. Thank you. 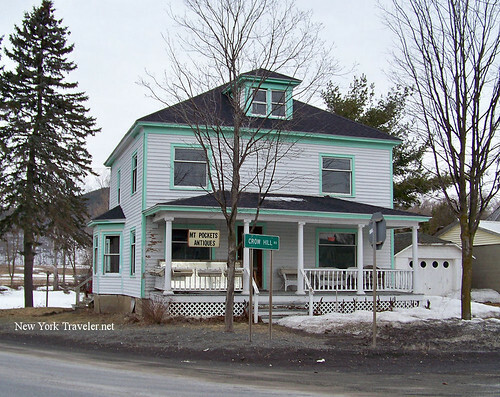 I’ve never been to Upstate New York, but I’ve been to Howick, Quebec which is as close as I got. When I saw your photos, I immediately thought of the Eastern Townships. That looks like a big flea market. I venture to guess I would have fun there. Hi, Fida! Thanks so much for that! It is a tiny museum, PTB. There are lots of them in Upstate NY. Robyn, I’ve never been to Canada (except Niagara Falls, long ago). I do have an inkling there are a ot of similarities between the two in this area. Karen- you’d be right! It’s one of the largest flea markets in the country. I used to like them, but I don’t like the crowds anymore. Hmmm. I’d expect just about any place of habitation, where late winter’s dirty snow and the resultant mud was preponderant, would look “weary” (used twice as a descriptive), probably even NYC. A little sunshine, greenery and the resultant people-on-the-street would make the scene in front of the Landmark quite animated. I’m from PA. This is a lovely town from Spring through Autumn, and an amazing outdoor party (many thousands of people) for that one magical week in mid-August. That building “Ye Olde Landmark Tavern” was my grandparents house in the 60″s and i have very fond memories of that era. In fact my father started that Antique show with his best friend Jock Hengst and it’s probably the best thing that ever happened to that sleepy little town. 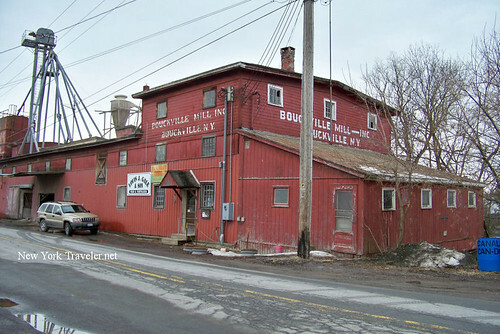 It’s been 40 years and i just randomly decided to google Bouckville NY-Those were the good days! I have lived in Bouckville since 1969. In 1974, when I was 14 I started working at “The Landmark.” Jock Hengst was my boss and we remain friends to this day. I knew Brad Palmiter’s father, Brian. His parents did indeed live in the building before it became a restaurant. In fact, rumor has it that the ghost of Brian’s mother haunts the building. I worked there for 5 or 6 years. When I was 16 Jock asked me to be the Hostess on the weekends and when I turned 17 began teaching me to tend bar. Eventually I was left to close the place during the week. The noises were a little spooky but if Mrs. Palmiter truly does haunt the place, she is a friendly ghost. The Bouckville Mill was originally a Motts Cider and Vinegar Plant. We had a Baseball team, and during World War I there was an air strip and pilot school. My cousin’t uncle was an instructor at the pilot school. If anyone is interested in learning more about the baseball team, my high school history teacher put together a collection of articles and photos. The book is called “The Pride of Cidertown” A History of the Bouckville Summits Baseball Team 1966-1935. It is written by James Ford. cheers to Bouckville! I grew up in that great little piece of quiet country and love that I can call it home. my father (Ted Bouck) had our family. Tree done and he told me about this little town and said we r related 2 it. So I dcided 2 google it 2 find out abt wht it looked like and so on. Nebody w historica info tht wud b kind enough 2 fill me in wud make me so happy. As Mrs. Jacobs said, the Mill was originally a Mott’s cider mill…THE Mott’s cider mill to be exact, as the company was founded there around 1842. So next time you see, hear of, or eat a Mott’s product, think of tiny Bouckville!